Google Nexus 10 Review – The Best Android Tablet Yet? Google’s latest tablet in the Nexus series, the Google Nexus 10, is a Samsung-built 10-inch tablet that takes square aim at Apple’s long-dominant iPad. With the powerful combination of a full HD display, impressive spec sheet, high build quality and a vast number of compatible Android apps, the Google Nexus 10 is a serious new contender in the tablet arena. Read on for our full Google Nexus 10 review. At the heart and soul of every tablet is the display, and the Google Nexus 10 has one the best we’ve ever seen. The 10-inch screen on the Google Nexus 10 is covered in scratch-resistant Gorilla Glass 2 and features a jaw-dropping resolution of 2,560 x 1,600, making it the world’s highest resolution tablet display. The pixel density weighs in at 300 pixels-per-inch – that’s 36 more per pixels inch than Apple’s much-lauded 264 ppi “retina” display. Colors on the Nexus 10 are wonderfully bright and images razor-sharp, and HD movies look amazing on the native 16:9 screen. Apple’s long-held claim to superior pixel-density has been overshadowed in recent weeks by the arrival of several amazing displays on Android-powered devices, including the 1080p display on HTC’s 5-inch Droid DNA, and now Samsung’s Nexus 10. In reality however, the displays on both the Nexus 10 and Apple iPad are of such high quality that you’d struggle to tell the difference between them in a side-by-side comparison. 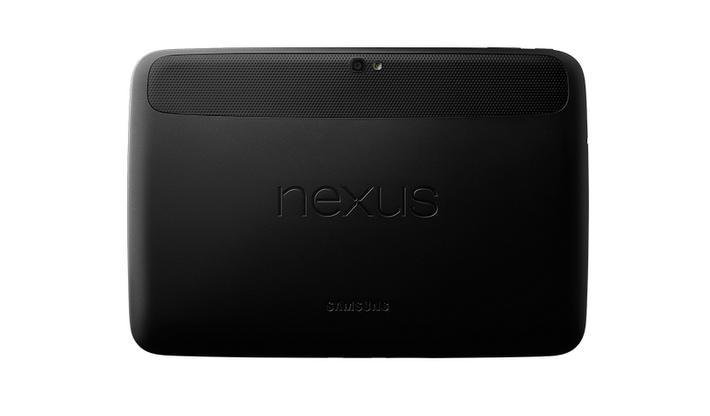 Under the hood of the sleek jet-black Google Nexus 10 is some seriously powerful hardware. Powered by a dual-core A15 Eagle processor, Mali T604 GPU and 2GB of on-board RAM the Google Nexus 10 is capable of lightning-fast app switching, slick multitasking and solid frame rates in graphic intensive games. Backing up the hardware specs is an impressively long-lived battery, yielding up to 9 hours of video playback and up to 500 hours of standby time. The 5-megapixel rear camera and 1.9-megapixel front-facing webcam on the Google Nexus 10 aren’t going to blow you away in terms of their quality, but they do the job. Despite some people that seem to relish in pulling out their iPad or other tablet to take holiday snaps with, the average day-to-day tablet usage for most people doesn’t involve much camerawork. However, this isn’t to say the camera on the Nexus 10 isn’t worthy – you can shoot 1080p HD video and take fairly decent photos too. The front-facing webcam, while just 1.9-megapixels, is more than adequate for video chat or high-quality Skype calls. 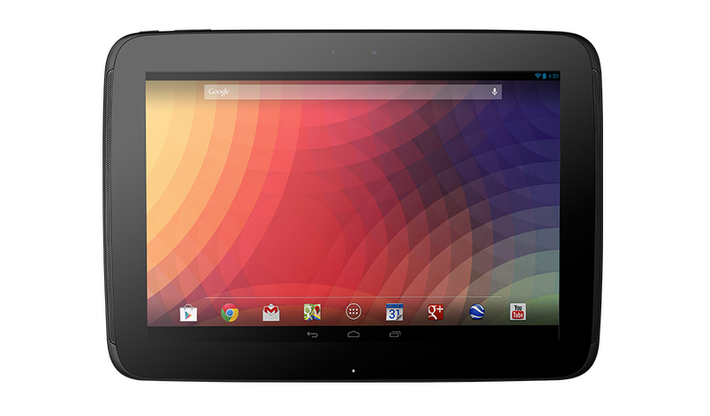 The Google Nexus 10 ships with Android 4.2 out-of-the-box, and is the first tablet to do so. It’s still technically Android ‘Jelly Bean’, like 4.1, but Android 4.2 has a whole host of welcome new features. One of the most practical updates is the ability to set up multiple user accounts on Android 4.2, an acknowledgement by Google that a tablet such as the Nexus 10 may be a family device and is likely to be shared amongst different people. Android 4.2 also features wireless display support, enabling you to wirelessly stream content to your television and home entertainment centre. Some other features like Gesture Type, Google Now and Photo Sphere are included, but are really more relevant to Android-powered smartphones like the new Nexus 4. Both the Android operating system and Android tablets have come a long way in the past 12 months, and it’s not hyperbole to say that the Google Nexus 10 is more than Just Another Android Tablet. The Nexus 10 represents what is really a new wave, or next-generation of tablets that offer a real match to the iPad. Android powered devices have always tended to outpace Apple in terms of raw specs, but it’s the other pieces of the puzzle that have been lacking to date. Design and build quality, a robust OS, and a rich app ecosystem have all been areas where Android-tablets have fallen short. The Android OS and the Google Play store still have a ways to go yet before reaching the level of polish and cohesiveness achieved by Apple, but the Google Nexus 10 personifies the change and highlights the fact that Google is firmly planted in the ascendancy. The Google Nexus 10 costs $399 for the 16GB version and $499 for the 32GB model, both Wi-Fi only. The Google Store currently lists both Nexus 10 models as in-stock and available for order, but there are reports that the Google Nexus has sold out in many locations.